Simple, healthy and delicious food and recipes... made by me. 1. Take a pork tenderloin and cut off the silvery skin, and fatty bits that you aren't interested in. Then cut it in two equal parts. On a cutting board, pound each half with a meat tenderizer on both sides until they are fairly flat. The flatter the better if you ask me. But you still want them to be thick enough to hold together. 2. Now set up your breading station. Take a plate, and fill one with flour, salt and pepper. Take a bowl, and fill it with one beaten egg and milk. You could also use water instead of milk to stretch it out. Lastly, fill a plate with bread crumbs. You could also use panko bread crumbs instead. 3. Dip each flattened piece of tenderloin into the flour mixture, and make sure it is fully covered. After the flour, dip it into the egg mixture and make sure that is covered as well. Then lastly, dip it into the bread crumb mixture and fully coat it. 4. In the largest pan you have, add 1/4 cup of oil. You don't want too little or when you flip your schnitzel there might not be a lot of oil left and the other side will get burned. 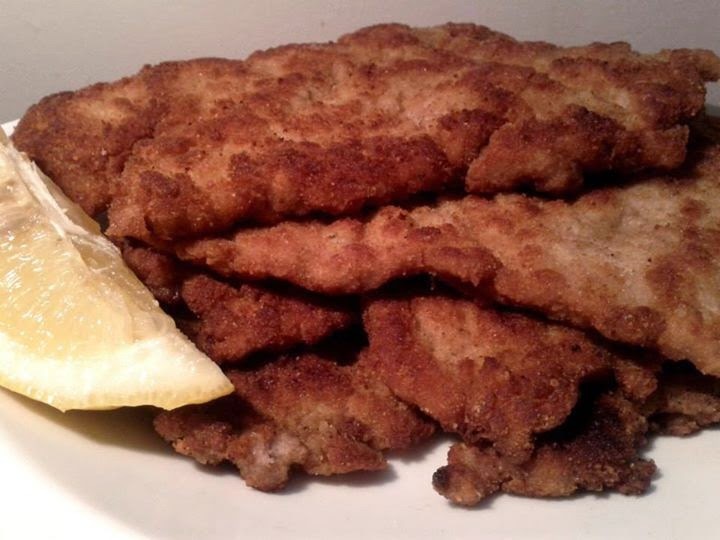 If you make the schnitzels fairly flat, it might only take a few minutes to cook each side. The first batch you cook in the oil will take a little longer. But as you cook the oil will get hotter, so be mindful of that as they won't take as long. Also, the schnitzel crusts tend to get darker as you cook. If you don't like that I'd suggest cleaning off your pan and using new oil between batches. 5. Serve with lemon. Or perhaps some sauerkraut, or mushrooms, or a mushroom sauce. This blog is dedicated to my love of food. As a 3D artist working on animated cartoons, I find food is a great artistic outlet for outside of work. I hope the things I share inspire or enable others to love food as much as I do.